This lavish sequel to the popular books (seven in all) joins “Angels in America” as this season’s highly recommendable two-part, multi-hour, British import, albeit one, unlike the Tony Kushner play, you bring the kids to see. Both are outstanding pieces of theater, not only for stagecraft but emotional content as well. 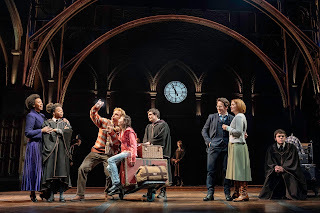 Playwright Jack Thorne -- in tandem with author J.K. Rowling and director John Tiffany -- have fashioned a worthy continuation of Rowling’s engrossing narrative that honors and enriches all the elements of the original. Harry Potter (Jamie Parker) is now father of young Albus (Sam Clemmett) of Hogwarts age who has grown up in the oppressive shadow of his famous dad. On the train to Hogwarts, with his friend Rose (Susan Heyward), daughter of Hermione (Noma Dumezweni) and Ron Weasley (Paul Thornley), Albus surprisingly bonds with Scorpius Malfoy (Anthony Boyle), son of Harry’s arch enemy at school Draco Malfoy (Alex Price), now a concerned father himself. Harry is married to Ginny Weasley, nicely played by Poppy Miller. Hermione now heads the Ministry of Magic, and Harry has a desk job there. Ron is still endearingly silly. The Showbill includes helpful synopses of the seven books and a glossary and even if you know the books (or seen the subsequent film versions), unless you’re a Potter obsessive, you’d be well advised to refresh your memory. Though I’d seen the films and read a couple of the books, I had frankly forgotten many of the details, so I found myself a bit lost at first. So, too, the actors tend occasionally to rush their lines, losing intelligibility. I had a veteran American actor on my left, and an English one on my right, and they were uniformly tsk-tsking at the sporadic lack of clear enunciation. For my part, once I read the synopses and the helpful glossary, I felt completely up to speed, and there’s no denying that the first act ends on a real cliffhanger, with coup de theatre stage effects. Indeed, the effects throughout -- not overdone, but used judiciously -- are quite astonishing. Jamie Harrison is responsible for “Illusions and Magic,” both of which brilliantly abound. Casting throughout is exceptionally well done, with most of the actors chosen for, or made up to look like, their movie counterparts, the big exception being Hermione. Ms. Dumezweni couldn’t be more different than Emma Watson, but she’s so dynamic and perfectly in character, one doesn’t sense any confusion on the part of the audience.. 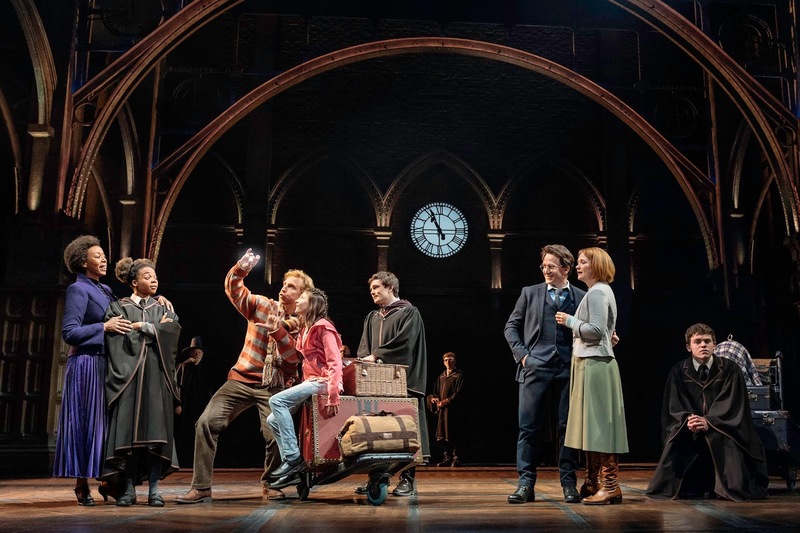 The excellent actor and singer Parker does well as the adult Harry, deeply troubled by his uneasy relationship with Albus particularly after he undercuts his son with a hurtful remark, but most of the stage time goes to Clemmett and Boyle, the latter particularly winning. The story is as gripping as the films, and given Rowling’s involvement, is invested with the requisite integrity. Fans of the series will not be disappointed. Tiffany directs with obvious affinity for the material, and the action is wonderfully fluid, thanks also to Movement Director Steve Hoggett. 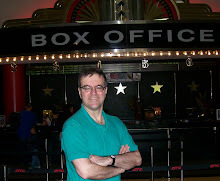 Sound Designer Gareth Fry’s stereophonic effects are also marvelously effective. Christina Jones’ set is a marvel, switching back and forth effortlessly from the train station to the Potter home to Hogwarts to various other locales, with various cleverly employed motifs including suitcases and clocks.. Finn Ross and Ash Woodward’s video designs and Katrina Lindsay’s costumes are splendid. For sheer entertainment value not to mention all the dazzling stagecraft, “Harry Potter and the Cursed Child” is tough to beat. And best of all, underpinning everything are such time-honored themes as parenting, friendship, love, courage; in other words, the stuff of drama and life itself.